Yesterday, I ended up visiting a couple of local quilt shops. These are the last, I swear. The first, Island Threads, I have blogged about before. Today was special because they had a sale begin today. I am almost never here for the sales. This was particularly good because they had selected fabrics from 30%-70% off. I bought 2 pieces for only $2.60 a yard! And 3 of the fabrics at $3.40 per yard! This trip has been great for buying quilt backings. I have about 5 quilts covered. The black with the hot pink dots was picked out by DD1. She wants matching tops made for her and her sister. She somehow always convinces me to make her stuff IF she happens to come to the quilt shop with me. The second place I stopped was on the way home from shopping at Sam's Club and Target. The girls had been good but I was 'done' for the day....or so I thought. I thought that until I was slowing down for a traffic light and spotted the new Quilters Cottage. What? new quilt shop??? woohoo.....I swiftly changed lanes and turned around. It was 4:15pm...so I knew I had some time. Well as you can see I did find some cool stuff. Since it is a new shop, ALL the fabrics are new...from Fall 2007 quilt market I am sure. They have Posh, Strawberry Lemonade, Lakehouse Cherry Baby, basically every new line of fabrics that I want. But I tried to be good...considering this whole vacation has been one awesome shopping experience. You can see in the pic that I bought 2 patterns from Bunny Hill Designs...well I had been planning on buying them from the Fat Quarter Shop but they were gone by the time I placed my order. So these jumped right in my hands. I don't regret any of my purchases I can tell you that. And what you really came to see is the funniest little girls ever. While mommy quickly skipped around the fabric shop my girls found the trash!....fabric strips from cutting fat quarters. DD2 especially had a ball. Notice she has one sock on and one off? well that is pretty much how she was the whole day..she kept taking the sock off..so I left it off! And the Posh fabrics that called to me once I saw how lovely they were in person. So whew what a week. I am shopped out. But get this, my friend Marilyn no-blog called and said she wants to go to the new quilt shop today!!!!!!! Here is DD1 again modeling with the fabrics...she loves to be in the fabric pictures.. They had so many styles here, batiks, 1930's reproductions, civil war, Thimbleberries, Moda Marbles, coordinates, Kaffe Fassett and on and on. There were so many books and patterns that I couldn't look through them all. They also have a large sale area of $4.99 a yard fabrics including Kaffe fabrics. I didn't get any as I don't need any to finish a project. I missed a lot in this shop and I am sure I will find more if I get another chance to look around. 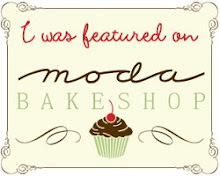 I love their fabric covered letters. One thing they didn't have a lot of, was samples...I was kind of disappointed by that, because they had SO much of everything else. Here is my meager purchase there....variagated Mettler thread, silk pins and one yard of a Thimbleberries fabric to finish a table topper. We did stop at one other place called the Fabric Warehouse. It was not too appealing for pictures so I didn't take any...I did buy a yard of fabric covered with vinyl Moda Strawberry Lemonade for DD2's bibs and a splat mat. Now we did go to JoAnn's and Barnes and Noble the next day and I found a few good items there. Some fabric, great after Easter deals, and some new amigurumi books and felt softie books, I hope to show that stuff soon. This was a great shop, Stop #3, Heartfelt Quilting and Sewing in Winter Haven. Tons of classroom space, about 2500 bolts of fabric, lots of new stuff and in the back they have an area with clearanced fabrics from $2.99-$5.99 a yard. I actually didn't buy any deals here, but I did pick up some odds and ends to add to my stash that coordinate with some charm packs I have purchased in the last couple of months. As you can see LOTS of class room space...and boy was this shop busy! My DD1 thought this quilt was awesome...'take my picture here' she said, so I did. These are my goods from the Yarn Basket in Winter Haven Florida...I think it was stop #6 that day. I wasn't going to stop actually. All I 'needed' were the size 2 circulars in 24 inch....as you can see I got ALOT more than I bargained for. This shop is a jewel. It's old..I mean 1970's old...it hasn't been updated in 30 years I am guessing. So it fails from the curb appeal sense....however, it makes up for it in sheer volume. Volume of everything cross stitch, needlepoint and knitting was awesome. I was overwhelmed. 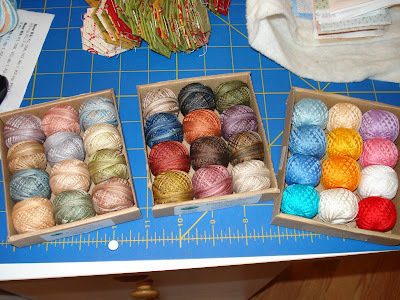 I couldn't just pick a few of these size 8 pearl cottons...so I got one of nearly each color she had. I know, do I need more stash? well I tell you, about 2 weeks ago I was working on this bunny wallhanging and for the life of me couldn't find a thread color in brown I liked. I contemplated ordering online but $5 shipping for a $2 ball of thread? I couldn't do it. So when I walked into this shop and realized what this gal had in stock...I thought "hey I am here, shipping is $0" and so I bought what I wanted to try to avoid my frustration of not having the wrong color again. So I would say, if you are in the area, the Yarn Basket is a must! We left at 9am and didn't get home until 4:30 pm. Both the girls went with us and were very very good girls. Actually this shop was our 4th stop out of 7...yep 7. Heart to Heart in Winterhaven Florida. They didn't have much fabric maybe 500 bolts but I did get a panel to do an apple core quilt with QuiltSmart interfacing. I didn't take pics inside because there weren't many samples. I don't think I will go back to this shop. This is Vanna's choice yarn by Lion Brand. I broke down and bought it as it was 30% off at Hancock Fabrics....now Hancock's is more like a store than a shop but I still wanted to blog about it. I plan on doing amurigumi toys with it. In fact Lion yarns have over 1500 free patterns on their website including toys. This was our first stop out of 7 and it was hard to beat it. Here's why, I bought 21 yards of fabric for $42...yep $1.99 a yard. 6 yards of the purple for backing and finished the bolts of the others...you can't find fabric for $2 a yard that is quality fabric...these were Windam fabrics and SSI. So my stash reduction has been reduced even more...I just couldn't pass these up...I have specific quilts in mind for them. Another view with my M.E. box...already in use by the way and a new punchneedle hoop so I don't poke myself to death anymore while punching. We're heading back to South Carolina today, so I hope to blog more shops tomorrow. I don't know what these flowers are....I am not a green thumb unfortunately. I do, however, love the colors and appreciate the beauty. These were all planted at my in-laws new home. They have had a lovely surprise seeing what the landscapers have planted. This is our cousins parakeet. 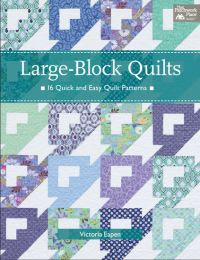 Now you are all probably curious about the quilt shops...well I have pictures and a bit of fabric purchases so I am going to post a couple of shops at a time. Some were very good and a few were just so-so....but over all it was a great day! We did make it to Florida after 2 long days of driving. The second half of the trip took two hours longer than it should have, so 23 hours total. It's 76 degrees here!!!!!!!!! a far cry from 35 in Ohio. 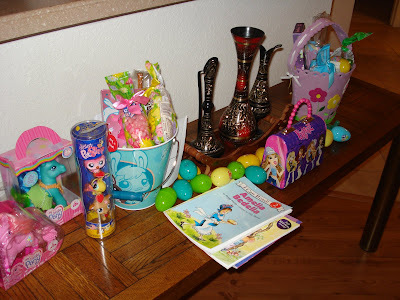 We had a great Easter here. 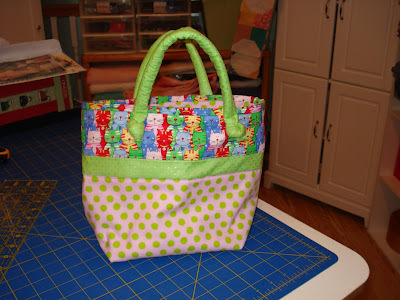 The little bag below I made for my DD1 from a Terri Atkinson book. I can't remember the name at the moment. DD1 picked the fabric from the Fabric Shack. It was an easy little pattern to follow. I remember showing this hat as a WIP several weeks ago. Well now it is quilted up and I made it into a pillow. These lovely LITTLE threads are 3-strand Valdini sets from Back Door Primitives. I finally broke down and bought some....kinda of pricey $$$ for such little thread. However, I LOVED using them. On the long drive I used different ones for about 5 projects. You know I have a lot of WIPs so I am slowly working on them and these threads motivated me to get some done. I will post them when they are completed. I even did some punch needle! It's been nearly a week since I've posted. And what a heck of a week it's been. Last saturday was my DD1's 7th birthday. She invited 7 of her 7 year old friends for a couple of hours....was I nuts?? That will never happen again, next year it's the bowling alley or Chucky Cheese! Sunday things started to get a little hairy, and my DH started feeling a little under the weather. He was home from work monday, tuesday and half of yesterday with the flu. Now the baby is ill and had a trip to the Peditrician yesterday too. So far DD1 and I are ok..but chances are it is heading our way. We are supposed to be going on an 11 day trip over spring break....ugh I don't know IF that will happen. On a positive note...I DID find a great new shop in our local area, BUT I didn't have my camera. It's called Back Door Primitives. I did ask the owner if I could come back with my camera so I can blog about it....so hoping to do that soon. They have handmade art works and sculptures, antiques, rug hooking, wool -- hand-dyed, DMC floss, 3-strand Valadini, punchneedle supplies and my absolutely favorite...Raggedy Annies!!!!!!! I already had 2 Annies from Nicole at Raggedy Old Annies and so when I saw these cute little girls, I just HAD to have them. Gosh there were so many to chose from. 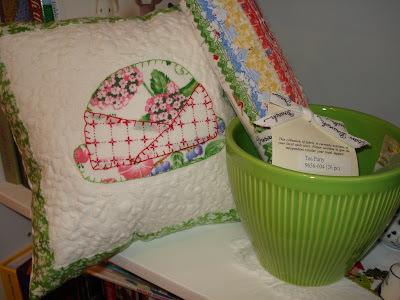 I can't wait to make the girls their very own raggedy quilts! Oh and last but certainly not least ....I sent my Melly and Me scrappy cabin swap package yesterday...so I am hoping Karen in Australia likes what I sent. I was going to blog a few more times this week but somehow my time got away from me. 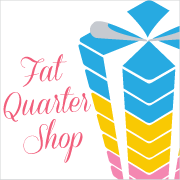 LAST friday I received a GREAT box from the Fatquartershop. I heart their online shop. I was able to buy a fabric that I have been searching for, for 2 years. It's an RJR confetti basic. I was floored when I realized that they were carrying it. Once it arrived on friday...I opened the box and by 10pm I had all the strips cut that I needed to finish a 2 year old project. Yes I know it's probably not the same dye lot as it is 2 years newer but once the blocks were pieced...I couldn't tell which was old and which was new. So all my little 4-patches are done. But wouldn't you know it, I haven't taken a picture yet. I did snap a pic or two of the box contents. I got a fat quarter shop exclusive kit called Tropical Punch made with Strawberry Lemonade fabrics. I just wanted a 'bit' of these fabrics and this trully fulfilled my want. I immediately started cutting for the small blocks. I decided to chain piece 3 projects at once. I also bought some great deals too. Here are my bundles of yardage...yeah I know I am thinking I should be stash busting, but really do you believe I would stick to a fabric diet?? Seriously though..these prints are mostly cotton and flannels from the Monkey n Around line by Moda. I had purchased several charm packs for $3 and so these fabs will be for borders, bindings and backings for baby quilts. Bits and Pieces book is also from FQQ shop. I was tempted by the front cover...and let me tell you....awesome, awesome, awesome book. Again, I cut them that evening...pieced the strips and now they are ready for me to use the 60 degree triangle ruler to cut the diamonds. 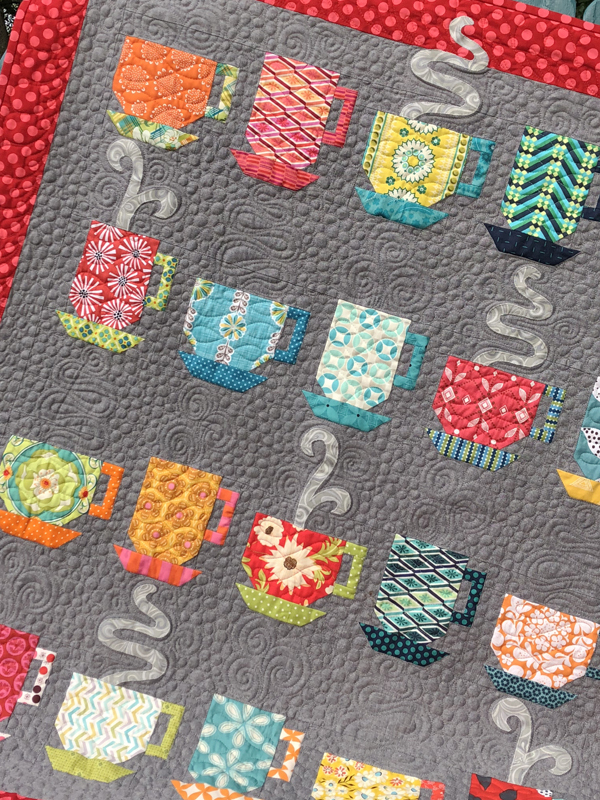 This is a challenging quilt with all the bias' and so I am not sure that mine will even remotely look like it was pieced correctly but I will love the fabrics and likely not care.